Ghanaian rap legend, Sarkodie broke the internet today when he finally responded to all the jabs from fellow musician Shatta Wale. Before now, Shatta Wale has been throwing shots at Sarkodie on countless occasions for ‘not supporting him’. 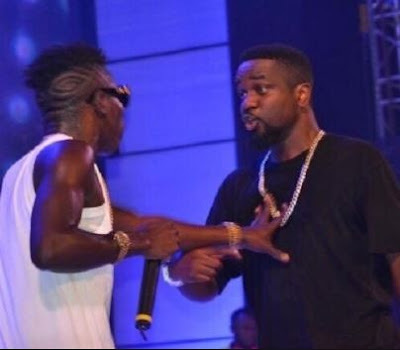 Their feud can be traced back to an interview Shatta Wale had on Hitz FM claiming Sarkodie refused to appear on set for their collab “Dancehall Commando” video shoot. In Sarkodie’s response to Shatta Wale in a song titled “My Advice”, he shreds the “Ayoo” hitmaker, throwing hot punches all over. Man took a sip of his Eva Sparkling wine and did dirt. Sarkodie is the Christian Council of rap. ???? Give @sarkodie the Balon d’orap! The fire ? on #MyAdvice can grill khebab for all Presecans at the #Bonfire night. Wow! Sark, who hurt you? Why you so angry? We need to talk!